DomainNames.com has been owned by Network Solutions, and the company put this domain name up for sale in the NamesCon auction earlier this week. One of the highlights of the live was the sale of DomainNames.com for $370,000. The winning bidder in the auction was Uniregistry founder Frank Schilling. The live domain auction held last Monday during NamesCon had several large sales. The total sales volume during the live auction was approximately $2.3 million. The NamesCon auction continues for two weeks (ending February 13) in the form of its extended auction hosted on NameJet. The NamesCon live domain name auction will take place this afternoon at 4pm (Pacific) in the conference keynote hall. The live auction will be conducted by auctioneer Wayne Wheat, and online bidding will be done simultaneously. There are 132 domain name lots in the live auction. 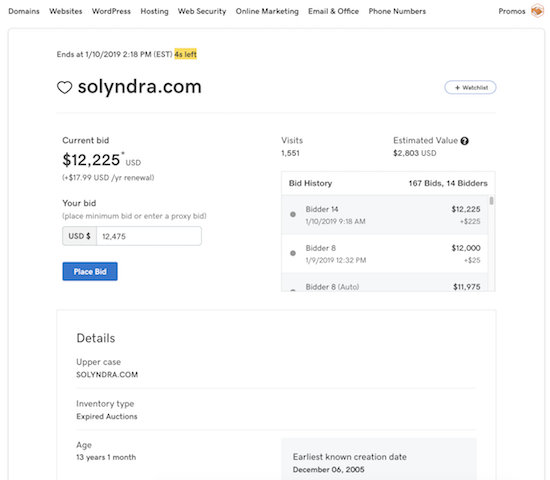 Solyndra.com, the domain name once owned by the bankrupt solar panel company Solyndra, expired and went to auction at GoDaddy Auctions. The auction ended this afternoon, and the Solyndra.com domain name sold for $12,225. There were 167 bids from 14 bidders who participated in the auction. 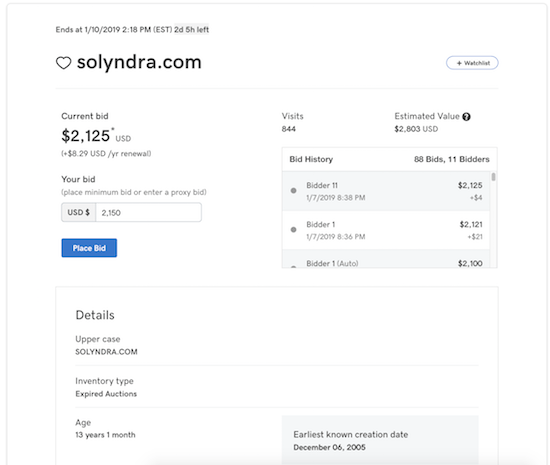 It looks like the Solyndra.com domain name expired, and it is currently in auction at GoDaddy Auctions. Solyndra was a solar panel maker that filed for bankruptcy after receiving a very large loan from the US government. Solyndra became a political buzzword during President Barack Obama’s presidency, and people still reference Solyndra today in political discussions. Brent Oxley was the founder of HostGator, one of the world’s largest web hosting companies. Since selling HostGator, Brent has become an investor in high value domain names. From what I can tell, Brent primarily invests in exceptional one word .com domain names. “There’s a big difference between auctioning a domain with a reserve price and one without. All of the domains I listed have a minimum reserve price which means I can’t lose. This is the first auction in which Brent has listed his domain names for sale. As he told me, in the best case scenario, he will sell inventory to net him millions of dollars, and in a worse case scenario, it’s an experiment that only costs him some time.